The casino game Roulette was founded in the 17th century in France. The name roulette is French meaning "little wheels". French mathematician Blaise Pascal is believed to have developed the wheels for his research purposes in perpetual motion. The game involves little white balls rolling around the wheel. Its layout was revolutionized in 1842 by two brothers Louis and Francois Blanc by adding a zero pocket. The game has since grown to become modern day European Roulette. Francois Blanc operated a casino in Monte Carlo which provided a home for the game and lead to its tremendous growth. Roulette first reached the United States in the early 19th century when some French immigrants carried the game with them to New Orleans. It has undergone more changes since then with another pocket marked double zero was added. This became known as the American Roulette which is believed to give the house greater advantage over the player compared to the European version. The game spread among American gamblers like bush fire. The game has gained increasing popularity in many casinos around the world. The small white balls in roulette have caused lots of excitement in the game all over the world. This is believed to be one factor that has thrilled many gamblers and lead to rapid growth and popularity of roulette as a casino game. 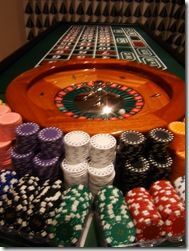 It is important to remember that many other casino games are based on counting cards and this is why roulette stands out as a unique game. Its rules are agreed to be quite simple and easy to learn but like with all games a player is encouraged to seek to know all the necessary rules about the games and any playing strategies before deciding to play roulette for money. Roulette remains a very important casino game whose table is often surrounded by excited fans and players in many casinos around the world. It has undergone several modifications over time and as it moves from place to place which has resulted in many variations coming up. Some rules have changed with development of different variations but the basic ones remain the same which make the variants essentially roulette and not a different game. The differences are in payout amounts, number of slots and number of pockets. The game is also played online since the invention of internet casinos.